InboxDollars is a popular and trusted online money making site that pays you for surveys, shopping, searching the web, videos, etc. Just like IPoll InboxDollars, too, gives $5 bonus to its new members (for sign up). Read: IPoll: Get paid for Sharing your Opinion. $5 Bonus for Sign up. When InboxDollars was launched in 2000 it gave its members cash back for shopping through it. It didn't have these many features. Because of the huge success, they started adding new ways for their members to earn cash like, surveys, games, apps, offers, etc. (I will be giving detailed description of earning methods offered by inboxdollars below). If you have used Swagbucks or GiftHunterClub then you won't have any problem earning with InboxDollars. Because these sites are very similar to InboxDollars, especially Swagbucks. Inboxdollars is one of the oldest online money making platforms. It came as a "shop & earn cash back" site. But now, it has become one of the most popular and featured cash earning sites. It has paid over $25 million to its members since it was launched in 2000 and encourages new members by giving away $5 for just becoming a member. I know, most of you are concerned about the legitimacy of inboxdollars. It's Normal. Inboxdollars has been running for about 16 years and it's been 10 years since it included surveys as their main asset. We all know a scam can't possibly last this long, right? InboxDollars is totally legit and you can sign up without worrying about the legitimacy of inboxdollars. 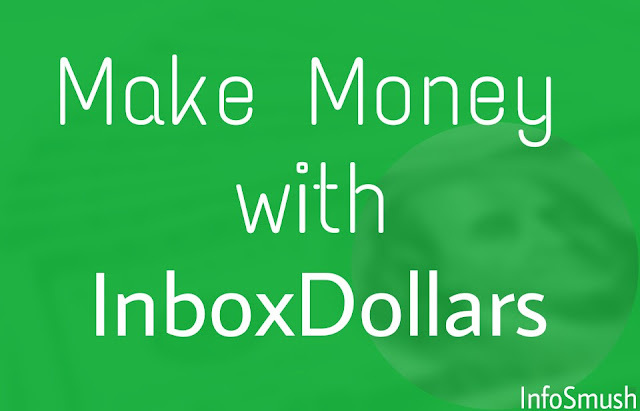 How to earn money with Inboxdollars? This is the part of where you will learn about the earning methods offered by inboxdollars. Yes, you can get paid for playing GAMES! Getting bored, just play some games; pass the time and earn money. Gaming is now rewarding. Well, we all know about surveys and how boring and long they can be. But if your OK with that, go ahead make some money completing surveys. Note: inboxdollars has less paying surveys as compared to Swagbucks and Gifthunterclub and some other sites. Get paid for trying products and services that match your interests. You must be thinking; what are paid emails? Well, PaidEmails are emails that inboxdollars sends you that contain special offers. You'll earn 2 cents for confirming the PaidEmails. To confirm, you will need to click the confirm button in the email. After that, 2 cents will be instantly credited to your account. You can earn additional cash by participating in the offer for the product or service that is being advertised in the email. You will get rewarded for watching videos. A WinIt is a code containing letters and numbers. When you enter a WinIt on InboxDollars you'll win prizes. 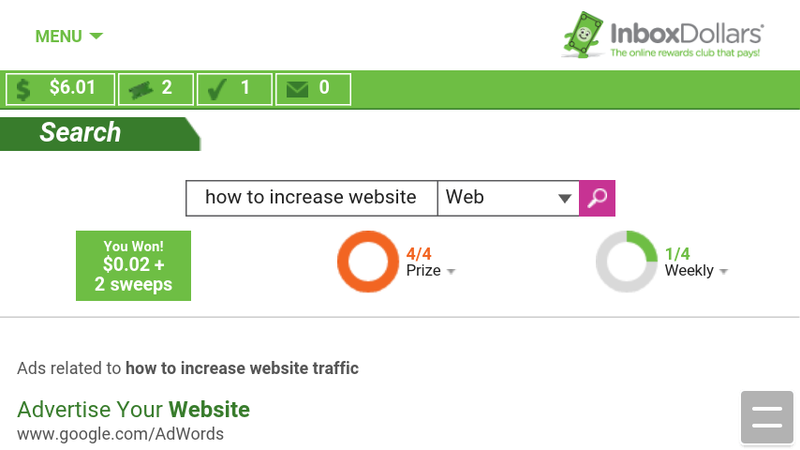 WinIt of inboxdollars is the same as SwagCode of Swagbucks. The only difference is: SwagCodes will only earn you SBs(points that are redeemed for gift cards) whereas WinIt can win you cash, sweeptakes entry or a contest entry. A WinIt can be found on social media channels of inboxdollars (facebook, instagram or twitter). It may even pop up on their blog. So, you are gonna have to frequently check their social media channels and blog, so you don't miss any WinIt. I know, it's a pain. But, you can do it if you're free. InboxDollars has hundreds of grocery discount coupons which you can use to get some discount on your grocery shopping. In addition to the discount, you will also earn $0.10 for each coupon you redeem! InboxDollars has a unique search and earn program. You win cash or sweeps or both for every 4 qualified searches. Search more, earn more. A qualified search is that which you make naturally, seeking results. Read the text below to know more about qualified searches. “Search This Site” searches URL or website domains, including terms that end in .com, .org, .net, .edu, etc. Well-known websites, such as AOL, CNN, Facebook, Gmail, Yahoo, etc. Searches that contain a phrase that yields no search results or gibberish. 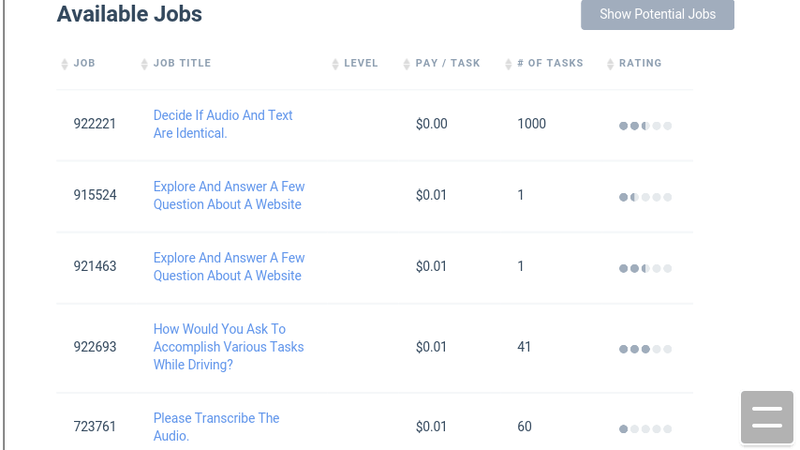 Searches made using a bot "
You can earn up to $0.15 each day through searches. Note that you won't always win cash prize but you'll always win sweeps. You'll also earn $0.5 bonus in any week where you make searches for four or more days. Gold members earn $0.10. In order to become a gold member, you don't have pay anything. You automatically become a gold member after you request your first payment. Refer your friends, family members and earn10% of their earnings on InboxDollars for life. Download apps that interest you and complete required actions to earn cash for that app. Shop through InboxDollars from the stores you love and earn cash back. Complete simple tasks from CrowdFlower and earn money. To complete cash tasks you'll need to sign up for CrowdFlower. Wikipedia- "Groupon is a global e-commerce marketplace connecting millions of subscribers with local merchants by offering activities, travel, goods and services in more than 28 countries." Credits can take up to 45-50 days to be added in your account. You may need to confirm some purchases through verification email. Apart from these, you can also win prizes with sweepstakes and contests. Minimum amount to request payment is $30. And to earn $30 you just need to earn $25. Yep, how can we forget the $5 bonus!